When it comes to dive trips, does it pay to plan ahead? We think so. Especially if you want to dive a super protected reef like Tubbataha. After a year of anticipation, we were blown away. This place has it all – a reef that is so dense in diverse marine life and topside some of the most beautiful island beaches we have ever seen. Check out a short video here. 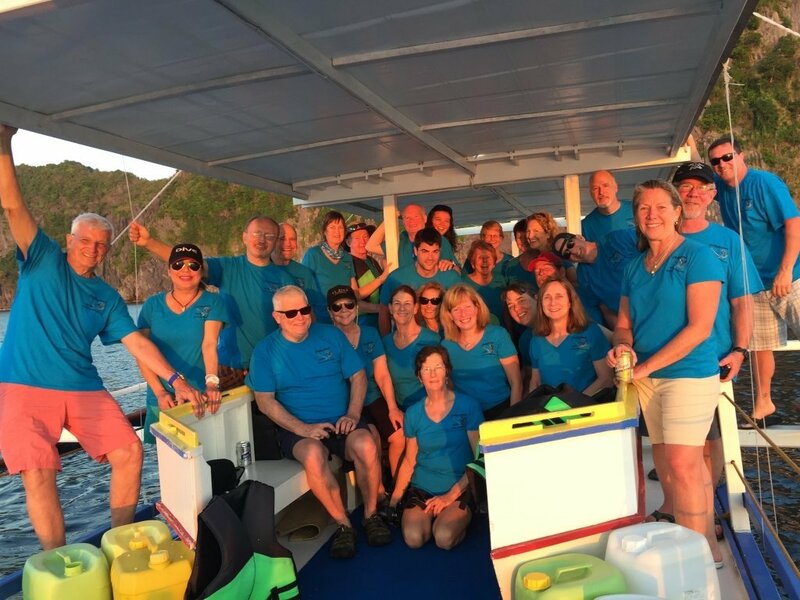 It was a great group of divers and snorkelers who enjoyed all kinds of big and little critters and day after day of beautiful sunrises and sunsets. Congratulations to Coni, Dee Dee and Michelle! Each of these divers logged dive #400 in Tubbataha. We also celebrated St. Patrick’s Day and Cathy and Pat’s birthdays on the trip. We had some “firsts” to cheer as well. For the divers who encountered their first whaleshark, first hammerhead shark and first manta rays, this trip was extra special! We can’t wait to go back and we are already working on trips to Tubbataha for clients for next year. If we can help you create your own dream trip to this dream dive destination, let us know. There is a limited diving season in Tubbataha and a limited number of operators. As we said, this one is worth planning for!